Just put it in your tank and you are ready to go. This digital thermometer will allow you to monitor the fluctuations of temperatures in your aquarium. This is vital to the health and well-being of all fish and corals as extreme temperature fluctuations can have devastating effects and decrease the lifespan of your tank inhabitants. 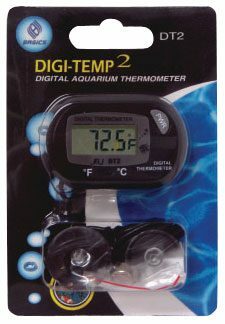 Just place the digi-temp inside your aquarium and your ready is ready to rock and roll! This does come with a replaceable battery. Questions on JBJ digitemp or any other products feel free to email us. Digi-Temp Digital ThermometerChecking your tank's temperature has never been easier! This stylish thermometer offers a constant digital display with +/- 1 Fahrenheit accuracy. They're also completely wireless and submersible.Perfect for Nano Cubes and any aquarium that demands compact size with pinpoint accuracy. All probes are integrated and include a battery for plug-n-play. Advanced Features: Digital Display Offers round-the-clock temperature display.